I always find this time of year a little strange when it comes to wedding stationery. We are really busy completing on the day wedding stationery for our summer brides in bright colours and butterflies, but at the same time we are completing loads of winter wedding invitation samples and putting together endless quotes for our Snowflake and Holly designs. 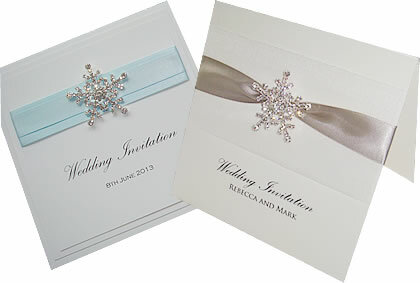 For anyone thinking about having a winter themed wedding then have a look at our winter wedding stationery designs. We have had a record year with bookings in 2012 and we only have a few spaces left in our diary this year, so if you are thinking of having us create your wedding stationery then i would advise placing your order soon to make sure we can book you in and you aren’t disappointed. Winter is often about sparkle and our Winter Wonderland and Organza Snow won’t let you down with their large crystal snowflakes that are full of bling! They are available as a pocket or folded wedding invitation with the Winter Wonderland starting at £3.70 and the Organza Snow £3.85. If Snowflakes aren’t what you are after then we have our Holly range which has a traditional holly print (this can be changed to suit your colour scheme) and is finished with satin ribbon and a gold and crystal embellishment. You can choose between White, Ivory or Cream Card on a good quality 300gsm board (with the extra layers on the front of the Winter Wonderland this reaches a whopping 900gsm!) and we have lots of ribbon colours to choose from. Samples can be ordered through the website so you can see for yourself why we love these crystals. 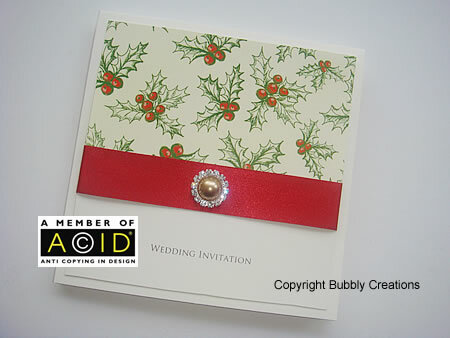 Perfect themed wedding stationary if you plan to have a wedding on Christmas season or winter season! The themed wedding stationary looks very great.